1. ICE WHEN? Always add the ice last. Otherwise you may over blend the ice and it will make your smoothie watery rather than frosty and icy like we all love. And FYI, most people underestimate the amount of ice to use. Crushed ice is what the Jamba Juice Pro smoothie-blenders use. 2. FRESH IS BEST. When you can, use fresh-pressed or squeezed juice. The flavor and nutrient boost will be outstanding. 3. FREEZE YOUR OWN FRUIT. When adding bananas to your smoothie, it is best that they are frozen bananas. Make a habit out of storing overripe bananas in the freezer for future smoothie use. Just remember to peel and chop the banana first. 4. PROCEDURE. 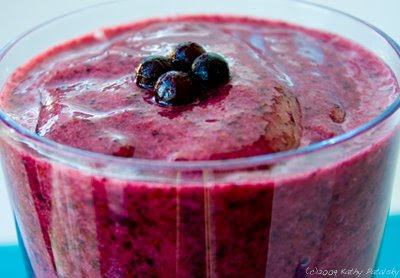 When adding ingredients this is the best procedure: liquid, frozen fruit, powders/add-ins, ice, and add fresh fruit LAST- even after pre-blending your frozen ingredients first. 5. FRESH ADD-INS LAST. Adding fresh berries to a frozen-fruit smoothie really enhances the flavor, and as mentioned, add fresh fruit last and blend minimally. 6. SOY-CITRUS, NOT A FAN. When making a soymilk smoothie it is best to stick with non-citrus juices and fruits to accompany it. Orange and soymilk may curdle or taste a bit 'off'. I like to blend soymilk with all different types of berries, bananas and sweet fruits like mangoes. 7. SOY-ACAI, I'M A FAN. My favorite soymilk survey is 1/2 soy 1/2 acai juice, fresh blackberries, frozen blueberries and a frozen banana. Add a lot of coconut water ice cubes, and I'm in smoothie bliss. 8. COCONUT CUBES. Make coconut water ice cubes instead of tap water ice cubes. This will add nutrients including potassium, magnesium and other electrolytes, and the smoothie flavors will not be greatly changed. 9. ADD AN ACID OR TARTNESS. Frozen blueberries are incredibly healthy, but do not have much acid in their flavor, therefore try pairing blueberries with another acid-y or tart flavor like fresh orange juice, tart pomegranate juice or lemon juice. 11. FIZZ IS FUN. Fizzy drinks like Kombucha actually make great slushy smoothie drinks. 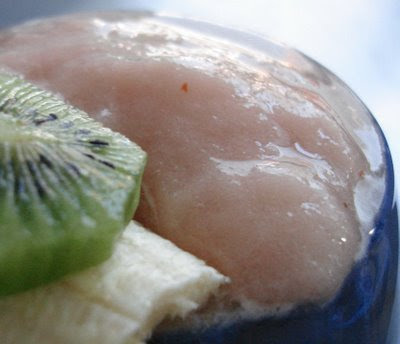 Blend fizzy kombucha with bananas and ice and the result is outstanding and different. Fizzy smoothies will separate quickly, so drink fast for best taste. Guava-Kiwi Synergy Kombucha Smoothie Recipe here. 12. NATURE'S SUGAR. You don't need to add sugar to smoothies! Just know what fruits and juices have the most sugar bang for their usage. High sugar add-ins: pear juice, bananas, grape juice, apple juice, pomegranate juice and yes a few dabs of agave syrup or maple syrup are OK too. 13. BEAT SMOOTHIE BOREDOM. Some less common smoothie add-ins and fruits to freeze or add fresh: papaya, kiwi, fresh mango, fresh blackberries, fresh young coconut meat, lychees, frozen seedless watermelon, tangerine juice, aloe vera juice or chunks, spirulina, kombucha tea, goji berries juice or whole berries, pineapple juice, fresh avocado, cayenne, sea salt, carrot juice, fresh ginger, Meyer lemon juice, grapefruit juice, fresh herbs and savory greens! 14. LESS LIQUID FIRST. It's better to add too little liquid than too much. 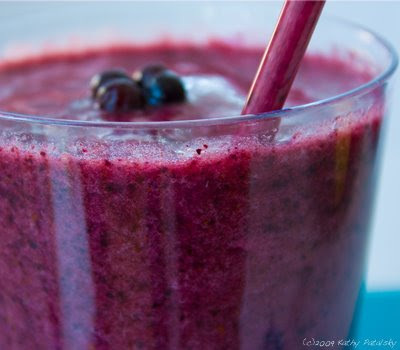 You can always add more liquid, but overblending too much fruit can get messy. 15. THROW OUT CRUSTY FRUIT. If you wouldn't eat the frozen fruit on its own, it's not going to taste good in a smoothie. Only use FRESH frozen fruit. The old-white crusted-over stuff is flavorless. 16. YUMMY IDEAS. A few great blends: lemonade-strawberry, mango-banana, kiwi-berry-citrus, soy-acai-berry, banana-aloe-pineapple, ginger-lemon-citrus, blackberry-soy, pomegranate-slushy, cranberry-lime, grape-Cherry-strawberry, fresh blueberry-tangerine-banana, banana-apple-raspberry, coconut-spirulina-blueberry, papaya-soy-aloe-banana, strawberry-banana-meyer-lemon-orange, lychee-coconut-banana, pineapple-banana-guava, orange-banana-grapefruit, frozen-watermelon-lime. 17. ICQ FRUIT. Jamba Juice and most big smoothie chains use ICQ, Individual Quick Frozen fruit. It is the best process for sealing in fruit flavor and nutrients. There is a vast quality gradient among frozen fruit brands-find a good brand and enjoy ICQ at Jamba Juice. 18. PROBIOTIC BOOST. Add in your favorite soy yogurt for a nice smooth flavor and added nutrition boost. Use plain yogurt for a nice tangy flavor. Lemon yogurt is also nice in smoothies. Sometimes I find the sweet berry yogurts can add a fake fruit flavor. Keep it real and fresh for your flavors! 19. A BLENDER IS A BLENDER? It's not a popular idea, but quite frankly I love getting a brand new $30 blender every other smoothie season. I once bought a fancy-smancy $100 blender and found that the quality was not much higher than my nice $30 Hamilton Beach blender. So it's not really about the tools, but about the ingredients and skill. However, those $200+ blenders that a lot of raw foodies use for smoothies, soups, etc, DO have amazing quality and lasting quality. But in the $20-$100 blender range...just go for the one button simpleton. 20. ORGANIC GOODNESS. Most of the time, organic fruit has more flavor and nutrients than conventionally farmed fruit. Therefore, when you can, always use organic fruit and juices. That's one area that Jamba Juice doesn't have 'up' on at-home blending. You make it yourself, and you usually get just what you want-organic,healthy,fresh and the entire blender all to yourself! If you have any questions about smoothie making, leave them in the comments and I will be sure to answer them all!